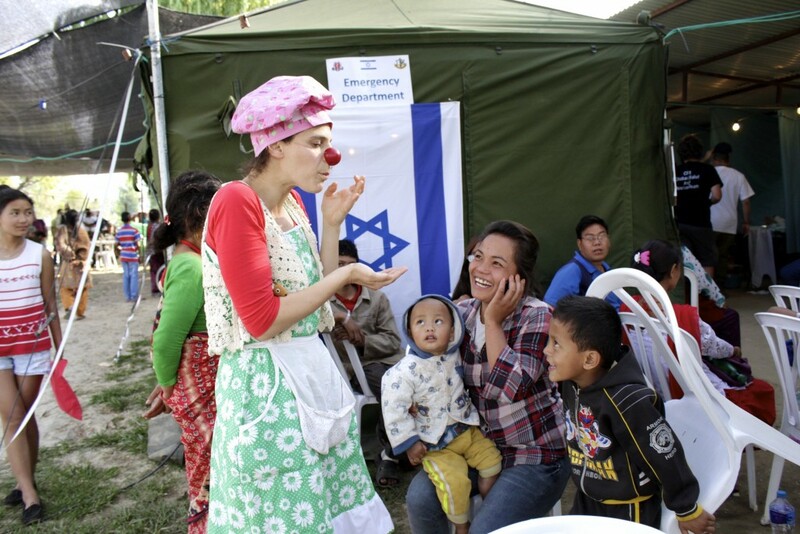 More than 120 Israeli doctors and medical workers flew to Nepal to assist in relief efforts, the largest contingent from any single country. A look inside their operation. When a 7.3 magnitude aftershock shook Nepal on May 12, less than three weeks after a 7.8 magnitude earthquake reduced much of the Himalayan country to rubble, the first thing Martine Bar-Om thought of was Trumpeldor. This was the nickname she and her fellow nurses at the Israeli field hospital in Kathmandu had given to their first patient, 19-year-old Sagar Majhi. It was a reference to the legendary Zionist pioneer Joseph Trumpeldor, who, like Majhi, lost his arm. When the second earthquake struck, Bar-Om had just returned to Israel, and was in the middle of a welcoming ceremony at Ben-Gurion Airport. 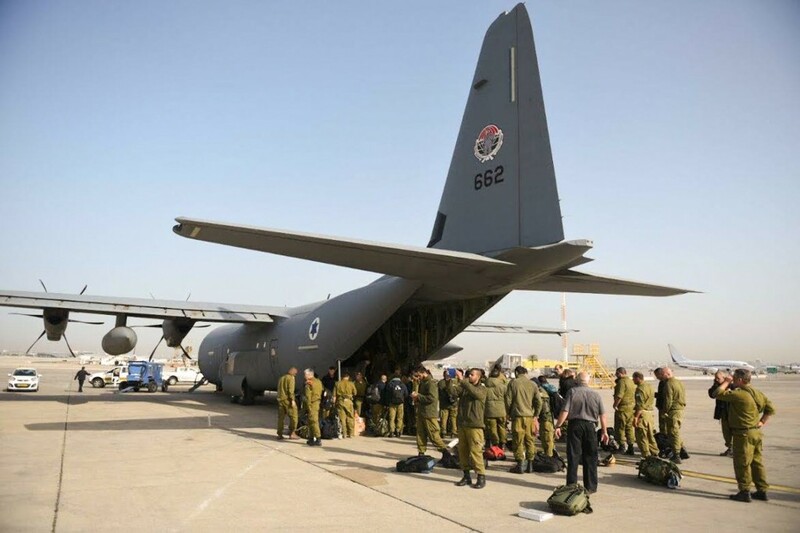 Prime Minister Benjamin Netanyahu was thanking the Israel Defense Forces (IDF) delegation for treating more than 1,600 patients over the course of their two weeks in Nepal. It was during this ceremony that Bar-Om heard the news that Mother Nature had dealt yet another unforgiving blow to an already devastated country. All she could think of was poor Trumpeldor. On Saturday morning, April 25, Sagar Majhi had been lying in bed, scrolling through Facebook on his cellphone. Suddenly the walls around him began to shake. The shaking grew stronger and stronger with each passing second. Not knowing exactly what was happening, Majhi instinctively jumped out of bed and headed for the door, hoping to get out of the house as quickly as he could. He only made it out of his bedroom before the entire house caved in on him. One wall came crashing down onto his arm, chopping it off at the shoulder, and the ceiling collapsed on his head. Thankfully, Majhi says he doesn’t remember any of it. His first memory after blacking out is of members of the Nepali army digging him out of his home in Kathmandu Valley. 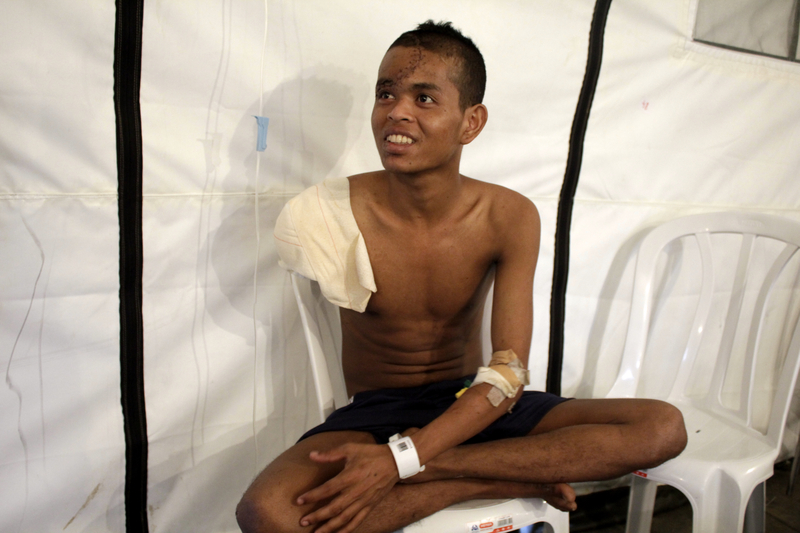 “I couldn’t see my arm and my head hurt,” Majhi recalls from his hospital bed inside the post-op tent at the Israeli field hospital, five days after he was first admitted. 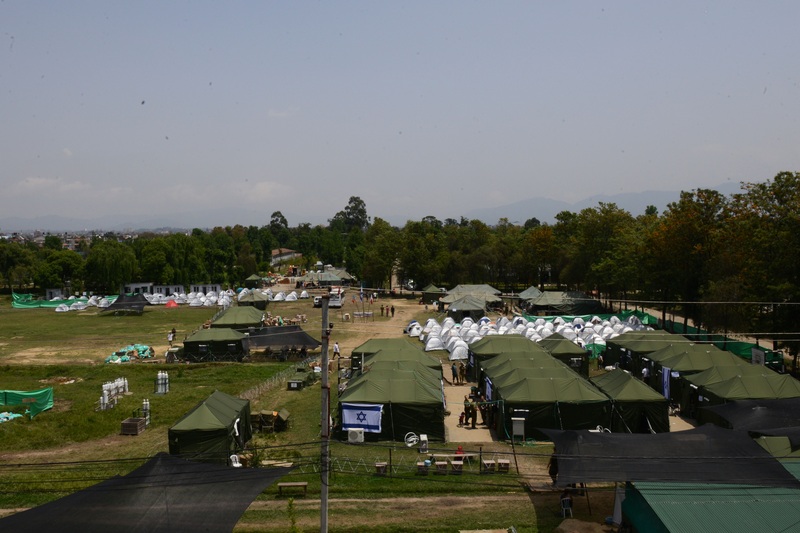 Although it is composed of tents flown in by military aircraft and sits in an open field, the IDF field hospital has departments like any other. Next to Majhi’s post-op tent (also referred to as the internal medicine department) is the orthopedic tent, and across from that is the operating room. There is also a pediatric wing, an OB/GYN department, an emergency room and triage center, an intensive care unit, an imaging tent, a lab, a dining hall; dozens of small tents where the doctors, nurses, and other IDF personnel sleep; and of course, a synagogue, which is essentially a Torah in a tent. The hospital is also equipped with the sophisticated machines and devices Israeli doctors are accustomed to, many of which are rarely found in Nepali hospitals. For many of the doctors and nurses here, this is not their first humanitarian mission. Some were part of Israeli relief efforts in Haiti, the Philippines, and Thailand. And while they are in Nepal on behalf of the IDF—either called up for reserve duty or volunteers—many of them are heads of their departments at the biggest hospitals in Israel. Dr. Jonathan Halevy, for example, is head of the internal medicine department at the field hospital, but back home he is Director General of Shaare Zedek in Jerusalem, one of Israel’s best hospitals. 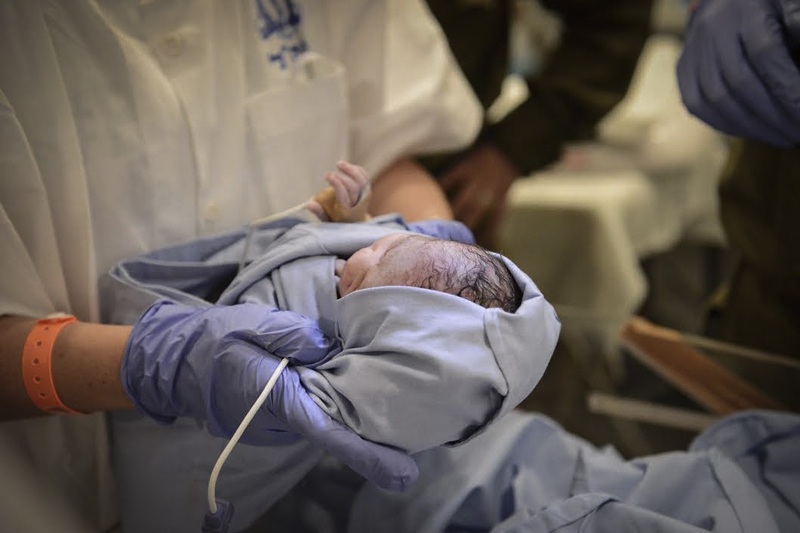 Alex Rechin is a neonatal nurse at Soroka Medical Center in Beersheva. Here, one of his patients is a premature baby born one month early. Weighing just three pounds, the little girl has spent her entire young life in an incubator, being fed by Rechin through tiny tubes inserted into her throat. Her mother, still in shock, hasn’t named her yet. When the Nepali army found Sagar Majhi two hours after the earthquake struck, they first brought him to the Nepali military hospital in Kathmandu. The hospital had sustained so much damage that it too was operating as a field hospital of sorts, with nearly all of its patients being cared for in outdoor tents. This was also done to avoid any further devastation caused by the aftershocks that have shaken Nepal several times a day. 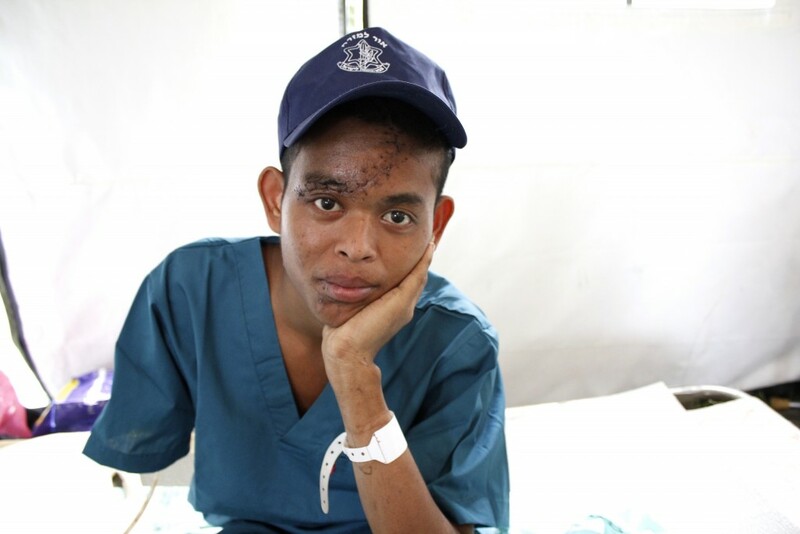 Overwhelmed by the destruction at their hospital and the daunting number of severely injured patients, the Nepali doctors performed an emergency neurosurgical operation on Majhi’s head, but did nothing more than bandage what was left of his arm, and didn’t even notice his broken hip. When Israel decided hours after the quake that it would send a massive medical delegation to Nepal—according to UN figures, the largest sent by any country—it chose to set up its field hospital next door to the military hospital, precisely in order to treat patients who had not received proper and comprehensive care. When it opened its doors on April 28, Majhi was one of the first patients to arrive. “He came here with a huge swollen head and a raw, improvised amputation,” says nurse Martine Bar-Om. The Israeli doctors performed emergency surgery, including a thorough amputation and, later, a skin graft from his thigh in order to cover the large gaping wound. They also operated on his eyes, which were infected, and his head, which needed more than 50 stitches. Over all, Bar-Om says Majhi underwent five surgeries over the course of his two-week stay. “When he first arrived, we called him Rakdan,” says Bar-Om, using the Hebrew word for dancer, because, two years ago, Majhi moved from his village in Udayapur district to Kathmandu—a seven-hour drive away—to attend a professional dancing school. 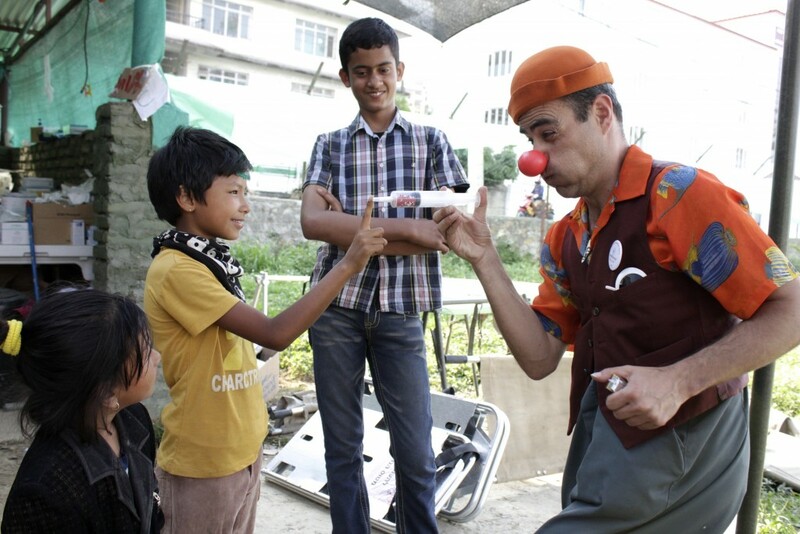 He loved all kinds of dance: Hip-hop, contemporary, traditional Nepali, everything. Now, with just one arm, a broken hip, and a long line of stitches across his entire forehead, Majhi has resigned himself to the reality that he will have to leave his dancing career in the past, along with the other precious pieces of his life that were taken by the earthquake. “I need to forget the world of dance,” says Majhi, with no self-pity in his voice or expression. He says he is just thankful to be alive. “It’s hard for us to call him Rakdan now, because we don’t think he’ll ever be a dancer again,” Bar-Om says. So she and the other nurses renamed him Trumpeldor, after the aforementioned Zionist war hero who, before fighting for the not-yet-created State of Israel during the British Mandate of Palestine, lost his left arm in the Russo-Japanese War. Bar-Om does not hide the fact that Trumpeldor is her favorite patient. She constantly dotes on him and calls him “Babu,” a Nepali word akin to “honey” or “sweetie.” “He’s our hero,” she says, just as one of the hospital’s volunteer clowns—brought in to lift the patients’ spirits—pops his head into the tent and sneaks up to Majhi’s bed. The clown, who looks like a mix between The Simpsons’ Krusty the Clown and Captain Jack Sparrow from Pirates of the Caribbean, stares at Majhi with a huge goofy smile and starts talking gibberish. Majhi’s entire face lights up and he flashes a wide smile that scrunches up the stitches on his forehead. Unlike other Western countries like the U.S. and UK, which have poured millions of dollars into Nepal’s recovery, Israel has not sent money to the government of Nepal. Instead, it sent 267 people, including 124 IDF medical personnel to staff the field hospital, as well as engineers to assess damaged structures and determine whether or not they can be lived in, or if they are too dangerous and need to be razed. The delegation came with 95 tons of aid materials, including advanced medical equipment that is either nonexistent or hard to find in Nepal. 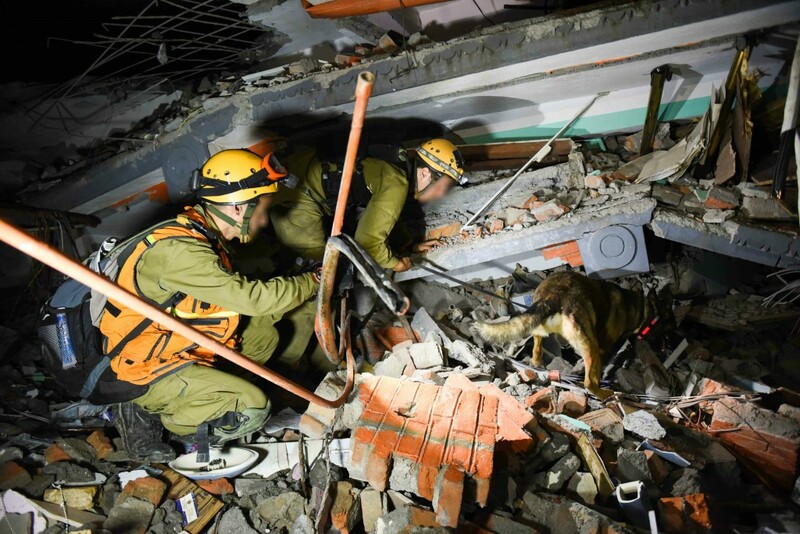 According to the UN, Israel also sent the third-largest search and rescue team in the immediate aftermath of the quake, exceeded only by Russia and India—countries with more than 18 times the population of Israel. When they arrived, the field hospital staff had no idea when they would be packing up their tents and heading home. Each day they saw nearly 200 patients; over the course of their two-week stay, they performed 85 life-saving surgeries and delivered eight babies. One major challenge the medical staff faced, aside from the obvious distress of caring for victims of a brutal natural disaster, was the language barrier. Many of the patients spoke not a word of English and, of course, no Hebrew. An unexpected solution to that problem was the influx of Nepali volunteers who started showing up at the hospital in its first days of operation. In addition to about a dozen staff from the Nepali military hospital, there were also around 20 Nepali translators who came each day. Some of them, like 37-year-old Mira Poudel, have lived in Israel as caretakers for the elderly, and thus speak fluent Hebrew. Poudel spent nine years living in Bat Yam, a coastal community just south of Tel Aviv, and had returned to her home in Kathmandu just one month before the earthquake struck. She loved living in Israel and says she misses it every day, but she has a 13-year-old son and wanted to take care of him. Thankfully, she says, her home wasn’t destroyed by the earthquake because it is newer and stronger than others in Kathmandu. The money she earned in Israel, she says, was the primary reason she was able to live in such a building. Her parents and sisters, however, weren’t so lucky. Their houses were all destroyed, because they live outside of Kathmandu, where homes are much less sturdy, often constructed of mud and stones. Poudel’s son is also serving as a translator at the field hospital, because he speaks decent English. Both of them have been suffering from post-traumatic symptoms like headaches, chest pains, and difficulty sleeping. “I thought, I can get help from really good doctors and help them too,” Poudel says before being called upon by a doctor to help translate for a young woman who has just arrived at the triage tent. 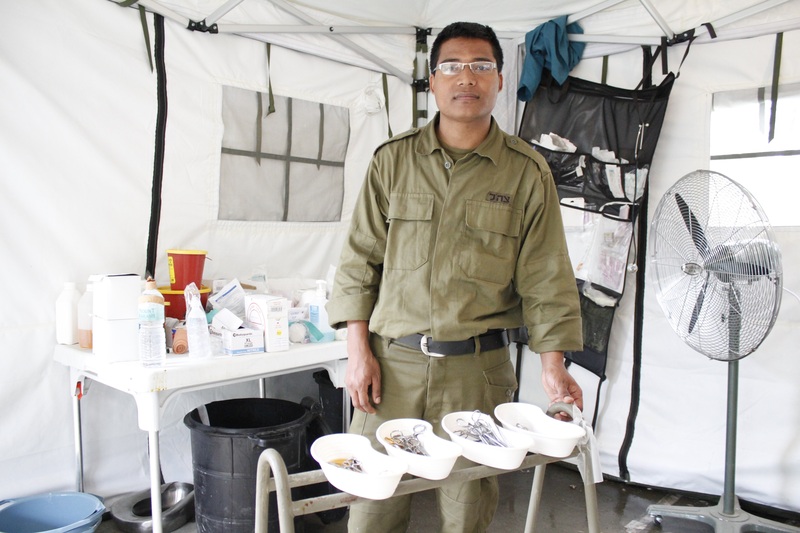 One of the doctors who came to Kathmandu with the IDF is Nepali himself. Thirty-year-old Krishna Kashichawa has been living in Jerusalem for the past two years, doing his residency in the orthopedic department at Hadassah Medical Center. When he arrived in Kathmandu, it was his first time in Nepal since moving to Israel. His entire family, including his five siblings, survived the quake, but their home didn’t. “Everyone is okay, baruch HaShem,” says Kashichawa, using the Hebrew expression for “thank God,” “but our house is destroyed.” Nonetheless, the earthquake had at least one silver lining: After not seeing his family for two years, Kashichawa was finally able to hug his parents, sisters, and brothers. The first time he visited them at their village in Bhaktapur district, he brought them blankets, tents, and money. “You know, they may need it,” he says sardonically. The patient died four days later, after his kidneys failed and his heart gave out. He was just 23. “I will never forget his face,” says Kashichawa. Although he is wearing an Israeli army uniform, he is not actually an Israeli citizen and never served in the IDF before this mission. Still, he says he feels every bit an equal member of the Israeli delegation, and even participated in Shabbat services at the field hospital. Like many of the Israelis here, Kashichawa volunteered for this mission. He was just finishing up a shift at Hadassah on the morning of Saturday, April 25 when he heard about the earthquake and knew that there were bound to be thousands of dead and injured. He immediately told the head of his department that he wanted to help somehow. His boss had heard that the IDF was considering sending over a medical relief team and possibly a field hospital, and recommended Kashichawa to the organizers. 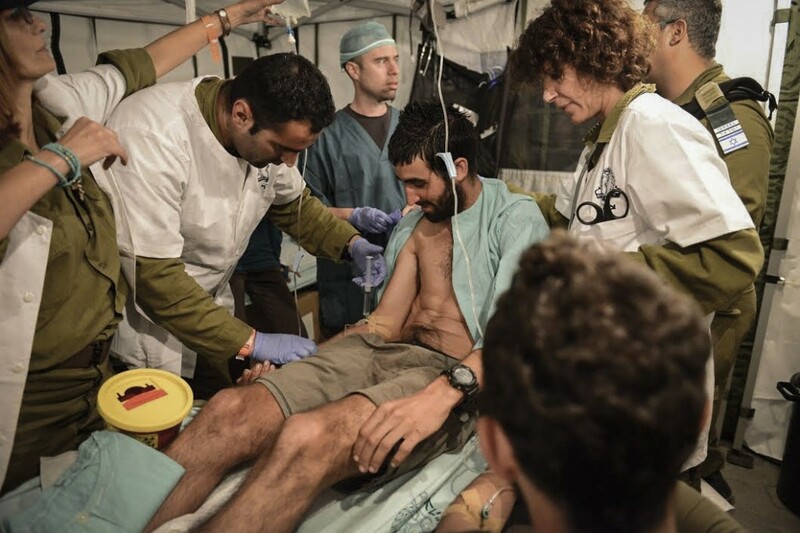 The very next morning, he got a call from Dr. Tarif Bader, commander of the Israeli field hospital and Deputy Chief Medical Officer of the IDF. Bader told him that the Israeli government had approved plans to send a medical response team to Nepal and he would be a part of it. By the following day, they were both on a plane. Bader can relate to Kashichawa’s bilingual and bicultural advantage. He himself is an Israeli Druze, and thus speaks fluent, native Arabic. For the last three years, he has commanded the medical officers of Israel’s northern command. For two of those years, he was the head of Israel’s field hospital in the Golan Heights, where military doctors have treated more than 1,500 wounded Syrian civilians who crossed the border to seek help outside their war-torn country. Bader, a pediatrician by trade, was just beginning a short vacation when he heard the news of the earthquake. For Israeli Druze, April 25 is the holiday of Nabi Shu’ayb, where believers visit the tomb of the prophet Shu’ayb near Tiberias. Bader was supposed to be in a hotel in northern Israel with his family for four days, but when he heard about the earthquake, he knew his vacation had ended. “Our experience is that whenever there is an earthquake or natural disaster anywhere in the world, we send assistance and dispatch a field hospital when it’s needed,” says Bader, who also took part in Israel’s relief efforts in Thailand in 2004, Haiti in 2010, and the Philippines in 2013. Lingering in the air, unaddressed throughout this humanitarian mission in Nepal, is the international criticism of Israel’s aid work. Asked about his response to critics who accuse Israel of helping a faraway nation in need while ignoring the plight of the Palestinians, Bader appears annoyed. Unlike other Israeli officials, who argue that it’s an unjust comparison given that Israel is not at war with Nepal and Nepali citizens have not attacked Israeli civilians, Bader seems to feel that there is no way to avoid the international vilification. “This criticism will continue to be here all the time,” he shrugs. Then he jokes that even in Israel there has been criticism, because in Israeli hospitals, patients can wait three months for orthopedic surgery; while here at the field hospital, the wait is less than one day. That these patients could wait any longer than a day is unimaginable. On one busy day in the orthopedic tent, among the six patients being treated was a man whose leg had been completely crushed. To fix his fractured bones, Israeli doctors performed an external fixation procedure in which a metal device that looks like a tiny bridge is installed and protrudes from the patient’s skin. As impressive as the medical work being done under these circumstances is, what’s more incredible are the patients’ stories of survival. Many here came face to face with death, and lost all hope that they would ever emerge from the rubble alive. Twelve-year-old Nangsal Tamang was trapped under a pile of rocks for five days before her brother, Sonamtasi, finally found her. At the time of the quake, Sonamtasi was inside their house in Palep, eight hours from Kathmandu. He ran outside just in time. Nangsal was playing outside when she felt the earth shake beneath her. Scared and confused, she ran into the forest, and was hit by a massive landslide. Sonamtasi had thought his little sister was dead until he found her in the rubble, her head smashed by the falling stones that had pinned her to the ground. Sonamtasi also found their aunt, who had been killed by the same landslide. After pulling his sister from the jaws of death, Sonamtasi brought her to another village for help. There he coincidentally ran into an Israeli rescue team, which sent them to the field hospital in an ambulance. Doctors treated her for a fractured skull and internal bleeding, and she spent the next 10 days recovering in a field hospital bed. Yet despite having her brother by her side every day, Nangsal was utterly depressed. Her nurse, Revital Elias, says that for nearly a week, Nangsal wouldn’t eat, wouldn’t smile, and cried almost all the time. When she first arrived on April 29, Nangsal had beautiful long black hair that framed her big brown eyes. But in order to operate on her head, doctors had to shave her hair off. Now, her head is covered with a thick, bloody bandage. Losing her hair was traumatic for Nangsal, but she’s also been crying for her parents, who couldn’t come to Kathmandu because there was no room in the ambulance. On top of that, Nangsal is virtually immobile due to the injuries she suffered. For a child who loved playing outdoors, the feeling of paralysis is terrifying, says Elias. Yet after six days at the hospital, she finally started to regain movement on the left side of her body. When Elias saw Nangsal smile for the first time, she cried. Now, when the volunteer clowns come to her tent every few hours, Nangsal laughs, rather than turning her body toward the wall. Other volunteers include aid workers from international NGOs, along with Israeli trekkers. 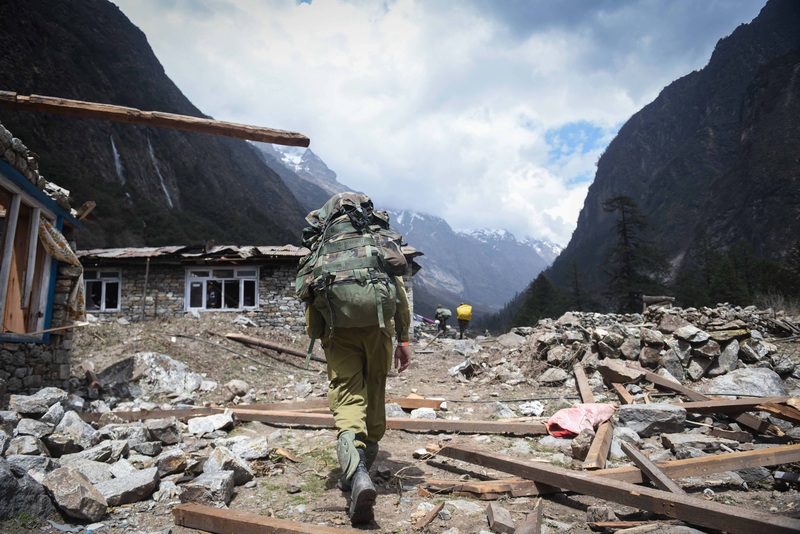 The Israeli Foreign Ministry says that there is no official estimate of how many Israelis were on the ground in Nepal at the time of the earthquake, but as of May 5, Israel had evacuated more than 300. Yet there were many who chose to say, like Keren Futeran, a 23-year-old who moved to Israel from South Africa in 2011, and was on a long post-army vacation when the earthquake struck. Lacking any medical skills but having picked up some Nepali during her travels, Futeran spent most of her time in the pediatric wing, trying to cheer up the young patients who often underwent painful operations. Seeing Nangsal interact with the volunteers, it’s clear that the young girl’s vitality has returned. Blowing bubbles with Futeran one day, she asks Futeran a question in Nepali. Futeran doesn’t understand it, so she asks a Nepali volunteer to translate. “She wants more bubbles,” says the young Nepali woman. Nangsal looks mischievously at Futeran, clearly aware that there are still plenty of bubbles in the bottle she’s holding. Yet perhaps after what she’s been through and all she’s lost, she’s not sure what could be taken away from her next. Another young patient who’s been at the hospital since its first days in operation is seven-year-old Anishka Manandhar. She and her parents were inside their house when it began to crumble, and both she and her mother were trapped inside. She underwent four surgeries at the field hospital and started a physical therapy program, but her father, who has been with her every day, says that the emotional support she’s gotten has been just as important. One afternoon, she’s lying in her bed, laughing and smiling while playing with a clown who’s brought her some tiny finger puppets. After an hour or so, two Nepali military doctors from the neighboring hospital come by to check up on her. They are dressed in military uniforms and have stern looks on their faces. Without the niceties or gentle touch that the Israeli nurses and doctors use, the Nepali doctors insert tubes into her leg and start moving her foot around. The tent is suddenly filled with Anishka’s cries and pleas to stop. Her father, Sohan, looks helpless, close to tears at the sight of his daughter in so much pain. Another patient’s brother echoes this sentiment. Sukuram Tamang, an 11-year-old boy from Rasuwa district, one of the popular trekking areas, was brought to the Nepali military hospital by helicopter with his 20-year-old brother Kagi. The doctors there transferred the young boy to the Israeli field hospital. A giant rock had fallen on Sukuram’s left foot during the earthquake and it had to be amputated. Watching his little brother rest in his hospital bed with a beehive-sized bandage around his foot, Kagi says Sukuram feels much more comfortable in the Israeli field hospital. After two weeks in Nepal, it was decided that the time had come to close the field hospital and transfer the patients and equipment to the military hospital next door. Tarif Bader notes that the field hospital had reached the point at which the majority of new patients were coming in for non-earthquake related problems like asthma, cancer, and other chronic issues. Ultimately, the IDF’s answer was to return to Israel, but to donate all their medical equipment and medicine to the military hospital. “We can’t let their treatment go down once we leave,” says Bader. “We can’t leave our doctors here, but at least we can leave our equipment,” which includes new machines and wheelchairs that cost thousands of dollars apiece. While Bader and others assert that the patients they are transferring to the Nepali hospital will be in good hands, there is palpable concern among others. Martine Bar-Om is clearly very distraught by the thought of leaving Majhi behind. On the final day of the field hospital’s operations, as doctors prepared patients to be released to their homes or transferred to the military hospital, Bar-Om darts around the tent, giving Majhi’s sister detailed instructions for his care, in addition to what she’s already told the Nepali doctors. She tells them several times that Majhi needs his own ambulance “because he’s special,” and mentions at least five times that he needs to be placed in an area with electricity in order to power the various medical devices that will enable his recovery. She wishes she could take him home with her, she says, but knows that he needs to remain hospitalized for at least another 10 days. She tries to be as hopeful and optimistic as she can be, but admits that she is worried that Majhi won’t receive the close attention and care he needs. “How can we know?” she asks, with a look on her face that says she doesn’t expect to. “The reason they want these patients is because of the machines and equipment that come with them. They don’t have them there,” she says, adding that normally the military hospital is only for members of the military and their families. Because of the earthquake, the hospital has loosened this rule, but Bar-Om worries about how quickly her former patients may be released. To ensure that they are taken care of, Bar-Om says, the Israeli team spoke with the UN and the Israeli ambassador to Nepal, who agreed to check up on the team’s patients after they returned to Israel. On May 9, after all of the patients have been released from the hospital—some transferred to the military hospital, others to homes that are no longer standing—it is finally time for Bar-Om to say goodbye to Majhi. In the end, the Nepali military wasn’t able to honor her wish to have him transported in his own ambulance. Instead, he is packed into an SUV-sized vehicle with another patient and several Nepali military staff. With no room for Bar-Om inside the car, she and a few other nurses walk across the field to the military hospital to make sure Majhi is placed in a room with electricity. Once they get there, they see that he isn’t. Instead he’s in a giant outdoor tent. Bar-Om refuses to leave until the Nepali doctors promise her multiple times that Majhi will be moved out of the tent and into another department with access to electricity. She hugs and kisses him goodbye, telling him how proud she is of him, and that all he needs to do is stay strong and he’ll be alright. As she leaves, Majhi looks around the giant tent filled with patients but barely any doctors and certainly no clowns. With his head still bandaged, and his nub of an arm attached to a disconnected draining machine, Majhi looks like he’s in shock. Yet even before she returned to Israel the following day, Bar-Om was already checking up on Majhi. The doctors did in fact keep their promise, and his machines were now hooked up. Bar-Om could go home feeling relieved that Majhi is going to continue the recovery process he started with her. 48 hours later, the unthinkable happened. While aftershocks had occurred every day the Israeli team was in Nepal, they were relatively minor. Experts said that a bigger aftershock would strike eventually, but few expected a magnitude of 7.3. The death toll from both the first and second earthquakes now stands at 8,635, making it the deadliest earthquake Nepal has ever seen. More than 21,000 people have been injured so far. Back home in Rosh Ayin the day the second earthquake struck, Bar-Om said she felt lucky to be home, but couldn’t stop thinking about what she left behind. After hearing the news that morning, she made some calls and found out that Majhi and the rest of the patients were doing fine. “It’s a miracle,” she says, that the military hospital wasn’t affected by the second quake. Still, she knows that anything can happen. There have been more than 200 aftershocks since the first quake, monsoon season is beginning, and many in Nepal, including Majhi, have been rendered homeless. They will be spending monsoon season in tents. For now, the best Bar-Om can do is hope and pray.